The City of Kilkenny has been pulling in crowds and crowds of tourists for as long as I can remember. Its fantastic 12th Century castle has been drawing spectators and history buffs to its doors from far and wide. Over the years the city has won a litany of awards including Ireland’s Top Tourism Town, the Tidiest Town in Ireland and the 9th friendliest city in the world. In recent years, it’s reputation as culinary destination has come on leaps and bounds, but it’s always been known for having some of the best accommodation available and this generation of hoteliers can be proud of the way in which they are carrying the torch for their city. On a recent visit to the Marble City, I spend a couple of nights at the Lyrath Estate Hotel, which, from the moment you arrive, makes you feel like somebody very special indeed. 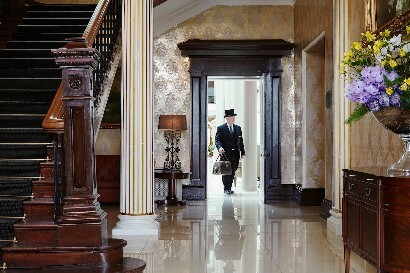 This beautiful 5-Star escape, which lies on 170 acres of mature parkland on the edge of Kilkenny City, boasts a raft of fantastic modern luxuries within a beautifully restored Georgian mansion. When it comes to accommodation at the Lyrath, their ethos is simple; elegant and luxurious accommodation in a contemporary style. The rooms, which are separated from the main body of the hotel creating a calmer sort of atmosphere, all feature TV, mini-bar and air-conditioning as standard whilst many of their suites and executive rooms feature furnished outdoor terraces as well. On my visit, we stayed in a wonderful double room with very attractive cream linens, a velvet soft bed, wide screen TV and a fantastic view over the magnificent grounds of the estate. For a bite or a sip there is so much to choose from at the Lyrath. Whether it’s a quick drink or a nibble in X Bar or Tupper’s; an intimate glass of wine in their wonderful stone and wrought iron wine cellar; or a full meal at one their two fantastic restaurants, La Perla or Yindees, neither of which you can really go far wrong with. For more information on these, see the restaurant side of my site. For a further bit of pampering, head straight for their Oasis Spa and enter a world of tranquility and pure relaxation as their highly trained staff offer all kinds of procedures to help you shake off the stresses and strains of every day life with their fantastic spa treatments that which they say embrace the “Seven Pillars of Wellbeing”: Beauty, Harmony, Vitality, Aqua, Life-balance, Nature and Nutrition. The Lyrath is the perfect place for a relaxing break with a bit of fun thrown in as well.